If you want to be the best, you need to learn from the best. We ask some pro photographers to share the secrets behind some of their greatest shots. "It was early evening and we are skirting around the lake to a location I'd spotted at the head of the valley," David Noton remembers. "An artfully sculpted piece of driftwood lay on the shore, leading the eye into the frame with the perfect peak of Mount Burgess beyond looking like a proper mountain; triangular and imposing. But if this shot was to work I needed accurate reflections, and one hour before dusk, a strong breeze was scudding across the glacial waters and spoiling the show." So began a long wait beside Emerald Lake, Canada. But patience isn't the only thing Noton has developed in almost 30 years of shooting. He knows from experience that, "Often, as the sun drops to the western horizon the world settles, the wind drops, and lakes become mirrors. It did it on this night, and as the sun dropped I attached my 24-70mm lens, with a polarizer fitted, to my Canon EOS-1D Mark III." Capturing the image was only the start, and a significant amount of post-production work was also involved. "To bring out the best of all the tones in the scene I made two separate conversions of the same RAW file – one for the highlights and one for the shadows," says Noton. "I combined these in Photoshop by selecting and feathering appropriate areas of the lighter image and laying them on top of the darker image as layers. All the information was there in the one RAW file, I just needed to bring it out – which is where attention to detail behind the camera really pays off." Noton shot in Aperture Priority mode with Evaluative metering. "I dialled-in +2/3 compensation," he says. "Any more and I'd start clipping highlights, but by exposing to the right like this I maximized shadow detail and the signal to noise ratio." To ensure that everything was sharp, David consulted his depth of field charts to determine the hyper-focal distance. Then, with his aperture set to f/13, he focused manually at this distance, knowing that he was maximizing his depth of field. Placing the horizon at the center is usually a no-no, but with reflection shots, it's near-essential. Dividing the frame into two halves gives sky and water a similar weighting, which would be lost if the balance were shifted more towards either the sky or the water. A tripod is the only way to keep your camera steady for landscape shots. It also enables you to fine tune the composition more easily and precisely, as well as letting you utilize low ISO settings and slower shutter speeds (here, ISO50 and 1/6 sec). Polarizing filters have two main uses in landscape photography: to darken skies and reduce reflections. Because polarization is a combination of polarized light and a polarizing filter, it's a technique that only works at the capture stage and is impossible to achieve through post-processing. This is why most landscape photographers would pick a polarizer as their number-one filter choice. Digital tilt-shift effects are increasingly popular, but for architectural and interiors photographer Paul Freeman, doing it in-camera has always been the preferred method. Like Joe Cornish (see page 45), Freeman took this shot with a large-format Ebony 5x4 camera. "It's strictly speaking called 'reverse Scheimpflug'," he says, "but 'tilt-shift' will do. Most architectural photography uses camera movements to make a more accurate rendering of a structure, but here I used them to do the opposite – tilting both the front and back of the camera to reduce the depth of field. Tilting the back also causes some perspective distortion, which helps to create the dreamlike effect." "The film I used was the now-obsolete Polaroid Type 55, which gives both a 5x4-inch print and a negative," Freeman continues. "The immediacy of the positive print is pretty much like shooting digital, but you can also peel off a negative and print or scan it, which adds another dimension. After washing the film, I scanned it and enhanced the image fairly extensively in Photoshop. The corner shading was partly caused by the lens and extreme camera movements, but I added Burn layers to create more drama. I also masked out the clocks and used a Dodge layer and Curve layer to bring them out and add more contrast. Painting has been a source of inspiration since photography's invention. With this shot Paul "was influenced fairly obviously by the artist L.S. Lowry", an artist known for his painted street scenes containing elongated, often dark figures. "The deep shadows remind me of the surreal painter Giorgio Di Chirico," says Freeman. The Scheimpflug principle is a classic large-format camera technique, which at its simplest involves tilting the lens forwards to increase the depth of field in an image. However, in this shot, Paul has tilted the lens backwards to reduce the depth of field, which also alters the plane of focus. Although much of the image is blurred, we can still see this is a cityscape, but the inclusion of four sharp points – the three clocks and the central, suited figure – immediately adds a narrative. This isn't just a creative cityscape, it's a photograph of work and time: as the old saying goes, 'time is money'. A number of traditional black and white darkroom techniques have been applied to the scanned image to selectively control the contrast, including selective Curves adjustments and dodging and burning. Making these alterations to Adjustment Layers means you can fine-tune the results without affecting the underlying image. While the shallow depth of field was achieved using a large-format camera, a tilt-shift lens will produce a similar look on a D-SLR if you apply a 'reverse' tilt and shoot wide open. Want to replicate the look in Photoshop? Visit www.photoradar.com to find out how. New York-based photographer Nigel Parry is best known for his portraits of celebrities from the worlds of movies, music, politics and sport. It only takes a quick glance through his inspirational website to see that this prolific portrait specialist has shot an extensive list of 'big names', including Barack Obama – for an equally impressive roll-call of editorial and advertising clients. On any shoot – no matter how large or small – there's a whole host of things that might go wrong and, regardless of the problem, it's the photographer who has to come up with the solution. Shooting Robert De Niro was no exception. "On arrival, Mr. De Niro – who was meant to be wearing black – wasn't," sighs Parry. "He was, in fact, wearing a slightly oversized tweed jacket and a pale blue polo shirt, which I knew immediately would not work for the shot. After a little explanation that the colours were way too distracting, he agreed to wear my coat instead, which isn't the first time that's happened. But with this simple change of wardrobe we were able to make the photograph I was after – a single image depicting him as an actor with many faces." "This is one of my favorite photographs; not only because of its simplicity but also because of its almost caricature-like representation of the many faces an actor must be capable of wearing. I also like it for its lack of digital manipulation!" To create the reflected image, Parry clamped eight mirrors, each measuring 4x1ft, to C-stands. 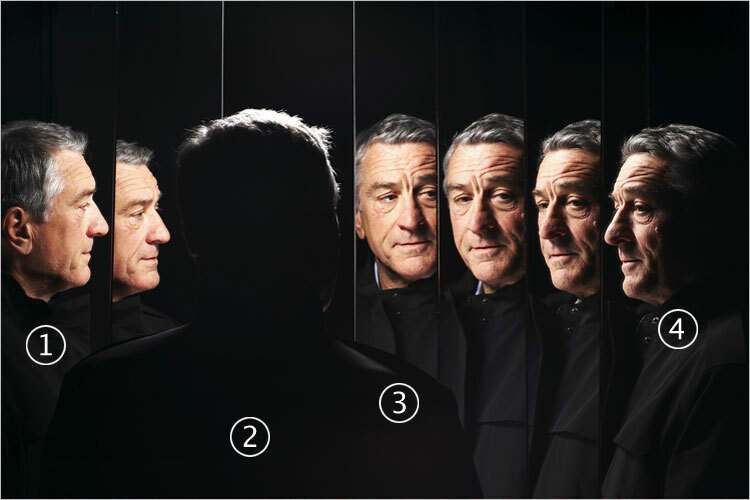 These were arranged around the subject (or, rather, around an assistant before De Niro arrived) to produce the 180° view, with the subject placed so that he would conceal the photographer's reflection. With his full-frame Canon EOS-1Ds Mark III, Parry has employed the classic portrait photographer's lens – an 85mm fixed focal length. The mild telephoto avoids the distortion you'd get with a wide-angle, and also means the photographer can work at a distance that isn't going to be uncomfortably close to the subject. Faced with such a large expanse of black, most in-camera Matrix, Evaluative or Centre-weighted metering systems would be fooled into over-exposure. A Spot meter reading will give a better result, but rather than rely on his camera, Parry used a handheld light meter to guarantee exposure accuracy. At a glance, this seems like a relatively simple composition consisting of an off-centre, silhouetted subject and a line of reflections. But look at De Niro's eyes – by having him look in a certain direction, Parry has used the actor's gaze as a subtle leading line, drawing the viewer's attention from left to right. Mirrors are great tool for photographers, but come with an obvious drawback – by their very nature they reflect a lot of light. This means you need to be careful that whatever lighting you're using doesn't bounce straight back into the camera lens and cause flare. You also need to make sure that nothing in the reflected background – such as the photographer – is going to create a distraction and ruin the whole image. Nick Danziger's career as a world-renowned photojournalist has taken him all over the globe, putting him at the center of events that most of us wish didn't happen. He's attracted myriad awards and honors, but Danziger isn't in it for the accolades; for him it's something much deeper, more human and personal. While other photojournalists have put the horrors of the Balkan conflict behind them, Danziger has returned to Bosnia to document ongoing efforts to identify the remains of 'the missing': men, women and children whose bodies are still being recovered from mass graves. The shot shown here, from his forthcoming book, Missing Lives, shows three Imams, Muslim clerics, and the 'boxes' at their feet contain the remains of the missing. "This image is important to me because of what it represents to the families of the deceased in the photograph," says Danziger. "Tens of thousands of families across the Balkans continue to live in limbo as their loved ones remain missing from the Yugoslav wars, their torment drawn out as long as ten, even 18 years. For many it continues still." Given his working methods, Danziger's understanding of the emotionally sensitive environment in which he operates is essential. "I tend to work close to people, not with telephoto lenses. This means I gain their trust to access the events I'm photographing. I believe this particular image captures closure for some of the many families of the deceased in a dignified and sensitive manner." Although the rule of thirds is often berated, it undeniably works as a compositional tool. Here, the two standing clerics are on thirds lines, as is the upper row of coffins. This instantly creates a sense of balance in the picture, with the central walkway leading the viewer into the shot. Danziger avoids flash wherever possible, and for this 'intimate' style of photojournalism that's definitely the way to go. Flash could easily destroy the atmosphere in this predominantly backlit shot, so a wide aperture (f/3.8) and higher ISO (400) are used to retain a naturalistic appearance. Favouring fast, wide-angle lenses, Danziger used a 12-60mm f/2.8 zoom on his Olympus E3. Set at a 40mm focal length (80mm equivalent) the mild telephoto doesn't compress the scene in the same way as shooting with a 'voyeuristic' long lens would, so it remains intimate. The back-lighting has created a mix of bright highlights and deep shadows, making the exposure slightly challenging. A Spot meter reading off the neutral wall in the background would have worked, but Danziger relied on his E3's Centre-weighted pattern to balance out the contrasting tones.